Application of routines from this section is described in the following tutorial. Plots a three-layer donut chart to visualize the repertoire clonality. First layer (“set”) includes the frequency of singleton (“1”, met once), doubleton (“2”, met twice) and high-order (“3+”, met three or more times) clonotypes. Singleton and doubleton frequency is an important factor in estimating the total repertoire diversity, e.g. Chao1 diversity estimator (see Colwell et al). We have also recently shown that in whole blood samples, singletons have very nice correlation with the number of naive T-cells, which are the backbone of immune repertoire diversity. The second layer (“quantile”), displays the abundance of top 20% (“Q1”), next 20% (“Q2”), … (up to “Q5”) clonotypes for clonotypes from “3+” set. In our experience this quantile plot is a simple and efficient way to display repertoire clonality. 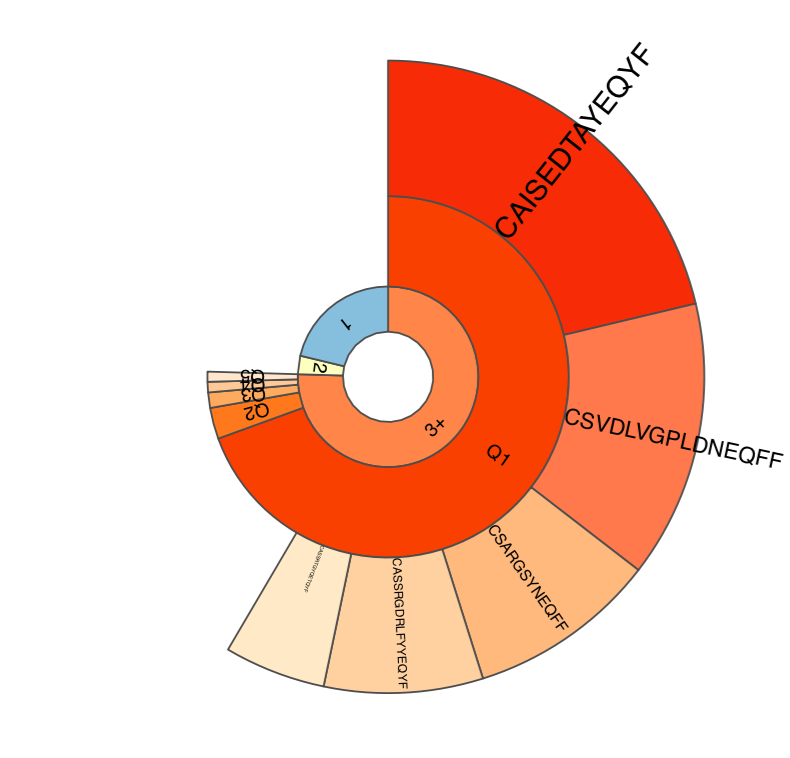 The last layer (“top”) displays the individual abundances of top N clonotypes. Sample clonality plot. See above for the description of plot structure. Plots rarefaction curves for specified list of samples, that is, the dependencies between sample diversity and sample size. Those curves are interpolated from 0 to the current sample size and then extrapolated up to the size of the largest of samples, allowing comparison of diversity estimates. Interpolation and extrapolation are based on multinomial models, see Colwell et al for details. A figure with the same suffix as output table and .pdf extension is provided. Rarefaction plot. Solid and dashed lines mark interpolated and extrapolated regions of rarefaction curves respectively, points mark exact sample size and diversity. Shaded areas mark 95% confidence intervals. Shannon-Wiener index. The exponent of clonotype frequency distribution entropy is returned. Normalized Shannon-Wiener index. Normalized (divided by log[number of clonotypes]) entropy of clonotype frequency distribution. Note that plain entropy is returned, not its exponent. Extrapolated Chao diversity estimate, denoted chaoE here. 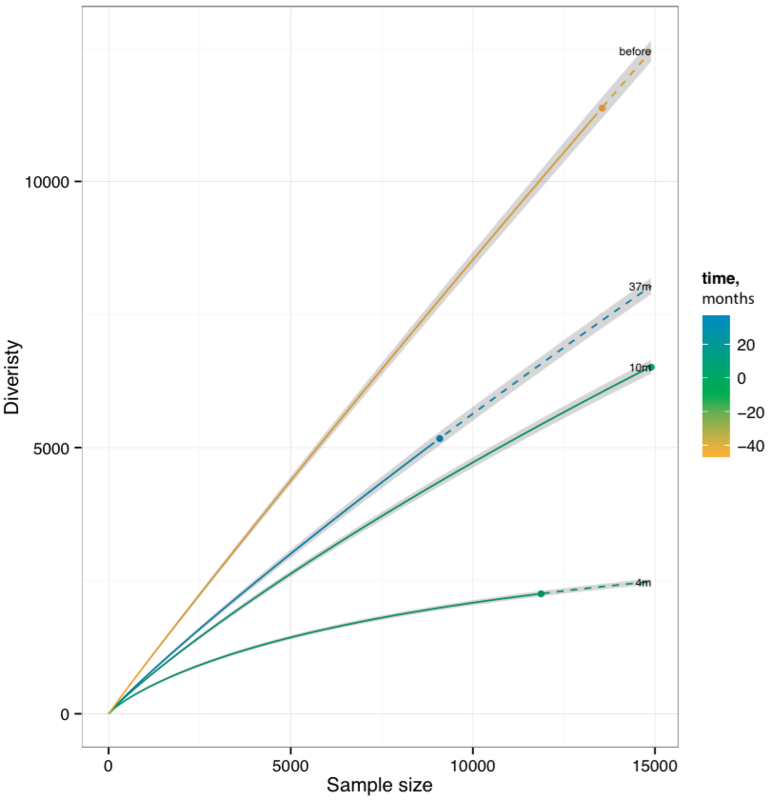 Diversity estimates are computed in two modes: using original data and via several re-sampling steps (usually down-sampling to the size of smallest dataset). The estimates computed on original data could be biased by uneven sampling depth (sample size), of those only chaoE is properly normalized to be compared between samples. While not good for between-sample comparison, the LBTD estimates provided for original data are most useful for studying the fundamental properties of repertoires under study, i.e. to answer the question how large the repertoire diversity of an entire organism could be. Estimates computed using re-sampling are useful for between-sample comparison, e.g. we have successfully used the re-sampled (normalized) observed diversity to measure the repertoire aging trends (see this paper). In our recent experience the observed diversity and LBTD estimates computed on re-sampled data provide best results for between-sample comparisons. -X --extrapolate-to integer Set the sample size to extrapolate the diversity estimates. Default = size of largest sample. Currently, only applies to chaoE diversity estimate. Two tables with diversity. [intersection type shorthand].txt and diversity. [intersection type shorthand].resampled.txt are generated, containing diversity estimates computed on original and down-sampled datasets respectively. Note that chaoE estimate is only present in the table generated for original samples. Both tables contain means and standard deviations of diversity estimates. Also note that standard deviation and mean values for down-sampled datasets are computed based on N=3 re-samples.